Script Werx is no longer available as a retail product. On Macintosh, Microsoft itself has decided that the next version of Microsoft Office for Macintosh will not support the programming language used to create Script Werx (Visual Basic). On the Windows side, the effort to update for Word 2007, and to comply with increasing burdens that Microsoft places on third-party developers, is too much to justify. Although I continue working on a project basis to develop software that customizes Microsoft Word, and to support my custom applications already in use, there will be no further updates to the Script Werx retail product. 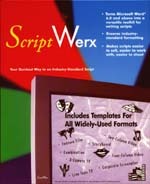 It's been a long ride since 1992, when the predecessor of Script Werx was first released to work with Word 5.0 on the Macintosh. I sincerely thank all of our customers who have purchased our software and made our company possible. It has been a rewarding experience and I am thankful for all of the friends I have made along the way. This Web site will be kept active for the foreseeable future, to give access to the technical support it provides and to make our final version of Script Werx available for download to existing customers.